Collection of the geeklets i made for my desktop, maybe someone is interested in them. Agreeing with Space Marine...Someday though I'll have a mac lol really nice "geeklets"
will this work with one of those hackintosh? Yes it works fine, i make a Tutorialhow to install a clean snowleoo on generic hardware on the weekend. 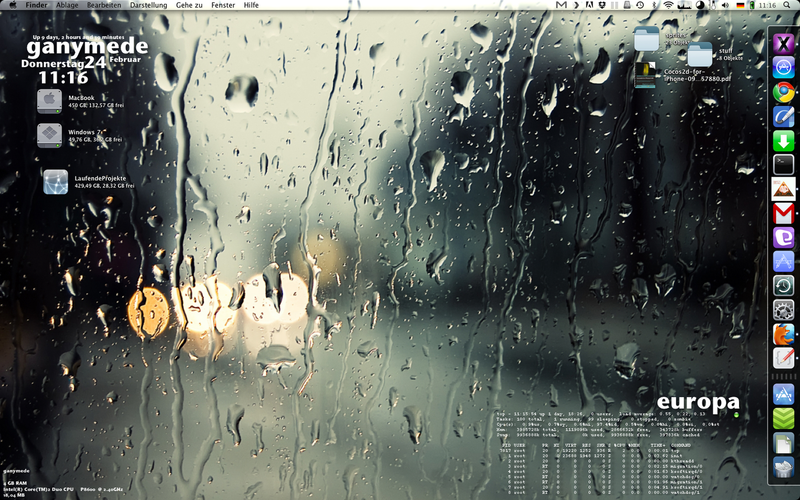 There are similar things for Windows with rainmaker, but man nothing compares to a mac desktop. whats the "X" in the right upper corner? Whoa, that is awesome, man! I dream of having a mac. Looks legit mate! There are so many positives to Mac's and yet one big negative (they're gay). I know so many friends at the mac store - it really is like a religion for some people. But when you look at the product, you can at least understand why. Holy Warfare: Top Ten Judeo/Christian Final Bosses! That's a very nice background, can you post it without all the icons? i LOVE macs man, never got one though. would you recommend it? are they like widgets or something? Lookin' awesome as usual, great job!